As previously discussed on this site, Dutch Symphonic Metal stars Delain have built one of the most durable and accomplished careers in the genre. Today, in celebration of their 10th anniversary, the band releases A Decade Of Delain - Live at Paradiso (Napalm Records), a two-CD/ DVD/Blu-ray showcasing the magic they have delivered to audiences around the world. On this special new release, the band’s current lineup (vocalist Charlotte Wessels, keyboardist Martijn Westerholt, guitarists Timo Somers and Merel Bechtold, bassist Otto Schimmelpenninck van der Oije and drummer Ruben Israel) is joined by a slew of guests including Alissa White-Gluz (Arch Enemy), Burton C. Bell (Fear Factory) and Liv Kristine (Theatre Of Tragedy/Leaves’ Eyes). I recently had the pleasure of reconnecting with past interviewee Martijn Westerholt, who was kind enough to bring Wessels along for the following chat about A Decade Of Delain, the band’s current success and their plans for the future. The new release is very significant in that it celebrates your 10th anniversary. What made The Paradiso an ideal venue to hold this event? Charlotte Wessels: (Giggles) It’s a few things. It’s the atmosphere of a very old and very charming building. It is beautiful with the Gothic arches. If you look at shooting a DVD, the eye wants something, too. This is a venue that – mixed with the name, the history and the good location of the place – looks really good. It also has some downsides. Of course, because it is a very charming old building, there are a lot of things that you cannot do production-wise. That’s why I had to giggle when you asked why it was the ideal venue. In certain respects, that made it very, very challenging. But it’s a very charming building, and it has a history. It’s kind of legendary in a way. This release was supported through a PledgeMusic campaign. What kind of response did you get from the fans by going this route? Martijn Westerholt: It was amazing. We could have done it easily through Napalm as well, but we wanted to involve the fans – because of the fans, we are here after 10 years. It makes it far more magical, and the support for that was overwhelming. We reached our goal so easily. It’s a lot of work to do it this way, because you have to do a lot of special things. Of course, it is a special project; the other side of that is that you have to do a lot of stuff for that as well. CW: Martijn and I still have cramps in our hands from signing the special signed editions! MW: I’ve never signed so much in my life! But it was great. You have some guests involved in this new release. How did having Alissa and Burton there with you add to the overall spirit of this release. CW: We released ‘Where Is The Blood’ in 2012, so it was a great experience to have Burton on stage with us and perform it. As for Alissa, she’s like a thunderbolt on stage. She’s done two guest appearances with us so far, so it was really lovely. We can really see the fans’ response to that as well. Then, we had other guests, including previous band members who joined us on stage. George Oosthoek was there, and we had virtual Marco Hietala [Nightwish] with us. On that DVD, that turned out quite remarkable; the images are super-cool. It was a great experience. MW: We had Liv Kristen as well, and so many others. Also, when we write our music, Charlotte and me have a third person, Guus Eikens, write with us. He is not in the live band, but this time he played a song live as well. It was kind of a unique for both the fans and for us. You’ve had Merel in the band for a couple of years now. How would you say she has evolved in that time as a member, and how has having her with you impacted the band overall? CW: The main impact of having Merel is having her on stage. She’s a really, really enthusiastic factor on the stage. There’s never a dull moment, and that really shines through. I really like the energy of her live performances. MW: Having two guitar players on stage also works for the sound really well. Especially with our latest songs, there are more guitar ingredients in our music. Of all the albums you’ve released, which one do you consider your crowning achievement so far, and what makes that particular album stand out in your mind? MW: That’s always a tricky question. In a way, it’s kind of asking which one your children do you love most… For me personally, it’s the last album, Moonbathers, because I especially like two things on that. First is the production and the sound; it worked out best out of all of our albums so far. The second thing is the contrast; there’s so much contrast on the album. There’s hard guitar riffing parts going on, and there are really soft parts going on. Take ‘The Monarch,’ the last song and, in a way, kind of a weird song. It’s kind of an outro; it’s not something we did so much in the past. There’s a lot of different stuff going on on the album. I think the diversity works really well, but still it’s a cohesive piece. CW: I have a special place in my heart for We Are The Others, but I do agree that when it comes to the contrast and the production, Moonbathers is really something that I think we all agree we want to build on our albums to come. A reissue of [your first album] Lucidity is on the way. Since you’ve obviously spent some recent time looking back on the album, what are your thoughts on it today within the context of Delain’s career? MW: It’s of course the start of Delain, so it will always be a special album in that regard. We still play songs from that album after all these years, and that really works. I don’t think we can make songs like that right now. You evolve not only as a band, but also personally. I don’t say with ‘evolving’ it gets better, but it gets different. I think production is better nowadays, which is one of the reasons why we did the reissue in addition to the 10th anniversary. I was really curious how it would sound with another mastering and another mix. You’ve succeeded in getting millions of views for your YouTube videos, and it’s obvious that the visual component is very important to the band. 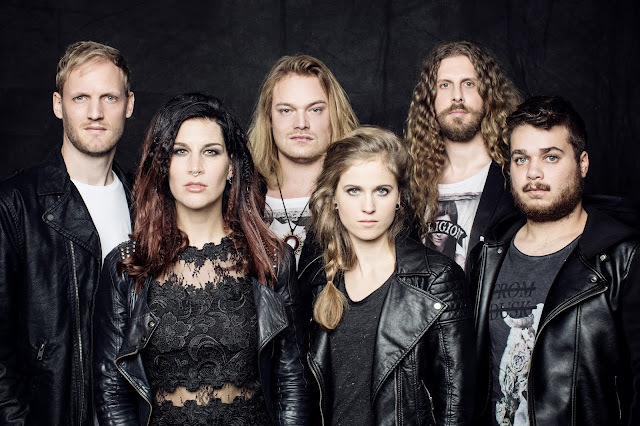 How would you say that side of Delain has evolved over the past decade along with the music? CW: I think that is actually something that we’re both still very interested in. When it comes to the music, I feel like we’ve really found our vibe. When I look at the songwriting, we’re tuned in to each other more and more. When it comes to the videos, it’s always very complicated because it’s a little bit more out of your hands. I think we’re definitely taking steps in the right direction. MW: I totally agree with Charlotte. I don’t think we’re done developing in that department. I think the next step is to make a lot of progress, and I think we will. I have a good feeling that’s going to work out. What does your 2018 look like at this point in time? MW: We want to keep low-key and low-profile because we want to focus on making the new album – to write it and record it. There were some tours offered, but we declined because we really have to focus on new stuff. 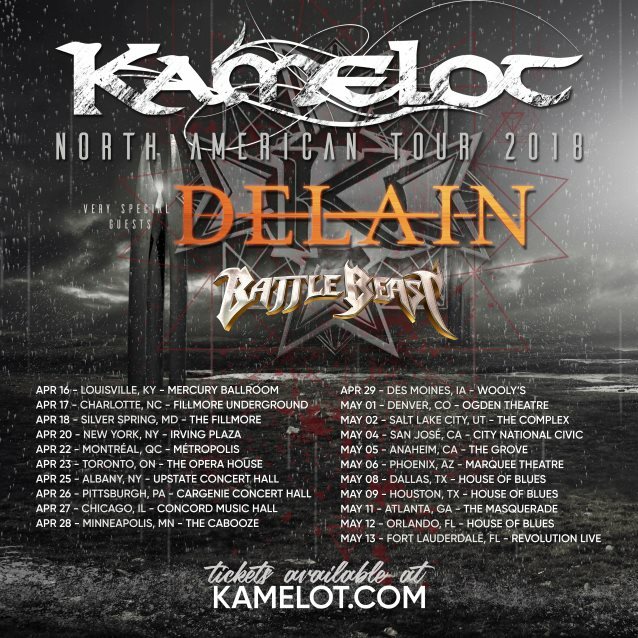 [Editor's Note: With one huge exception; see tour announcement below.] That’s the main objective in 2018. CW: We’re going to be doing a lot, but you won’t be seeing much of it! If I’m not mistaken, won’t this next studio album be the first time that Merel makes it on a Delain album? MW: That’s true, but in our case, it’s never a big issue. To be frank, Charlotte, Guus and I already do everything, and we do try – and are very open – to welcome band members to participate on it. But this train is rolling with or without them – preferably with them. But for us, it’s not a big issue. We do like to have them involved and stimulate that. For example, Timo did a lot of guitar arrangement on our previous album. I don’t think people will hear a big difference. With all due respect to Merel – because she’s great – it’s not the way Delain works, so to say. But I do hope that she will contribute, and she surely has the talent for it. She’s very creative, so let’s see what happens. It’s difficult to last 10 months in this business, let alone 10 years. What has been the key to Delain’s perseverance? CW: Good question! I think we’re just both extremely committed to what we do. We’re kind of idiots in that way. Martijn and myself, if I may be so free to say so, sometimes have to tell each other to not only think about music and the band and every now and then take a break. Of course, I don’t know where that comes from, but I just think we’re emotionally and professionally committed to what we do.